While mobile devices have gotten faster and better over the years, the Battery tech have more or less remain the same resulting in need to recharge our devices more often. Which means a lot of people spend a lot of time tethered to the wall socket for hours depending on the amount of time required to charge our batteries. If the Quick Charge 3.0 feature been introduced by Qualcomm in their upcoming Snapdragon 820, 620, 618, 617, and 430 processors. The time required to charge a device to full capacity could be reduced to just 1 hour with 30 minutes been all that's required to get a 75% battery boost. 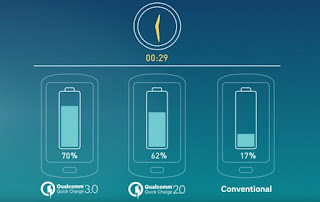 Quick Charge 3.0 utilises Intelligent Negotiation for Optimum Voltage (INOV), a new algorithm developed by Qualcomm Technologies, designed to allow portable devices the ability to determine what power level to request at any point in time for optimum power transfer, while maximizing efficiency. With Quick Charge 3.0 you can charge a typical phone from zero to 80 percent in about 35 minutes compared to conventional mobile devices without Quick Charge that may typically require almost an hour and a half. With, INOV and other advancements, Quick Charge 3.0 is designed to be up to 38 percent more efficient than Quick Charge 2.0, while also implementing additional steps to help protect battery cycle life. 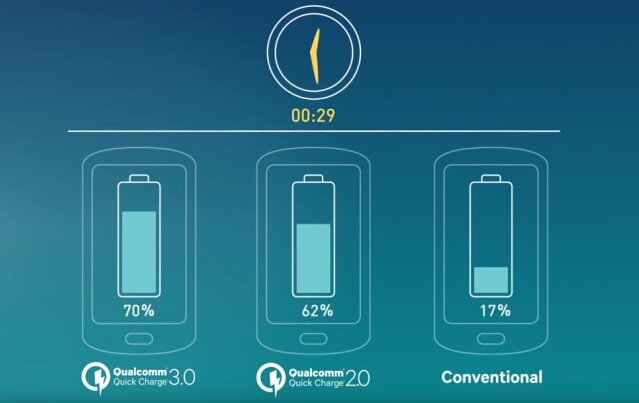 Additionally, when used with Qualcomm Technologies' latest, advanced parallel charging configurations, Quick Charge 3.0 can: Help improve fast charging up to 27% or reduces power dissipation by up to 45% when compared to Quick Charge 2.0. Charge up to 2x faster than Quick Charge 1.0. The Samsung Galaxy S7 would be one of the devices to come with Quick Charge 3.0 technology when it is announced next year.